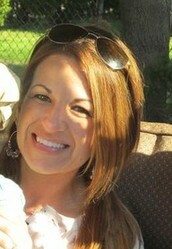 Terri-Lynn is using Smore newsletters to spread the word online. 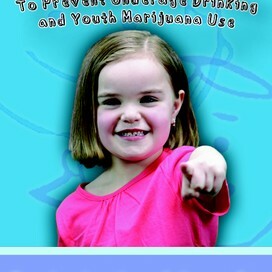 Communicating with you, so together, we can promote a safe and healthy drug free environment. March has come & is almost over but all of us at the Cumberland, Lincoln & North Smithfield Prevention Coalitions, are already in full "Spring Mode"! We have been working & planning for this season, as we have so much in store! In this edition of Communi-Key, we are so excited to share the amazing projects we have been working on, as we gear up for yet another, amazing Spring! “Never cut a tree down in the wintertime. Never make a negative decision in the low time. Never make your most important decisions when you are in your worst moods. Wait. Be patient. The storm will pass. The spring will come." The Annual Town Hall Meeting: SUCCESS! 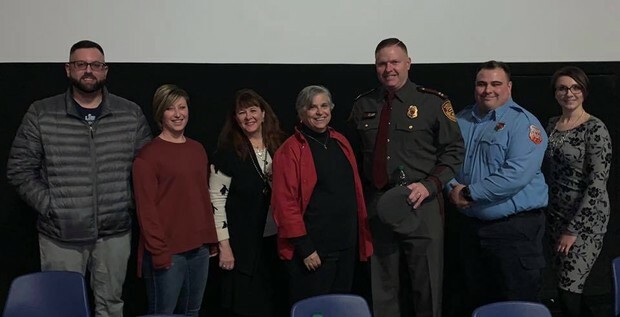 On March 5, the Blackstone Valley Prevention Coalition sponsored the sold-out event titled “Big Screen Discussions: Addressing the Opioid Epidemic,” held at Cinamaworld in Lincoln. The meeting featured keynote speakers, a panel discussion and a special free viewing of the film “Beautiful Boy,” based on a true story of addiction. It was a wonderful opportunity to collaborate and meet so many new folks from our communities! We are looking forward to continued partnerships and continuing to educate the Blackstone Valley Region! We would like to sincerely thank our Guest speakers, panel of experts and all who attended the event. We are truly grateful for the tremendous support we receive from our communities! For more information on the Town Hall Meeting, click HERE! It was an amazing day for our youth on March 20th at the RI Statehouse for “Tobacco-Free Generation Advocacy Day”! We are so very proud of the young men and women in our communities on "Kick Butts Day", Campaign for Tobacco-Free Kids annual day of youth anti-tobacco activism! At more than 1,000 events – covering every U.S. state and six countries – youth advocates are standing up to the tobacco industry, highlighting the devastating toll of tobacco use, and urging elected officials to do their part to stop the number one cause of preventable death. And congratulations to "one of our own" from Lincoln High School, Arianne Parvaresh-Rizi! 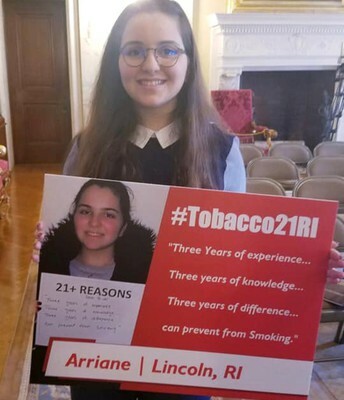 Arianne’s quote on why the tobacco sale age in RI should be raised to 21 was selected out of many submissions. 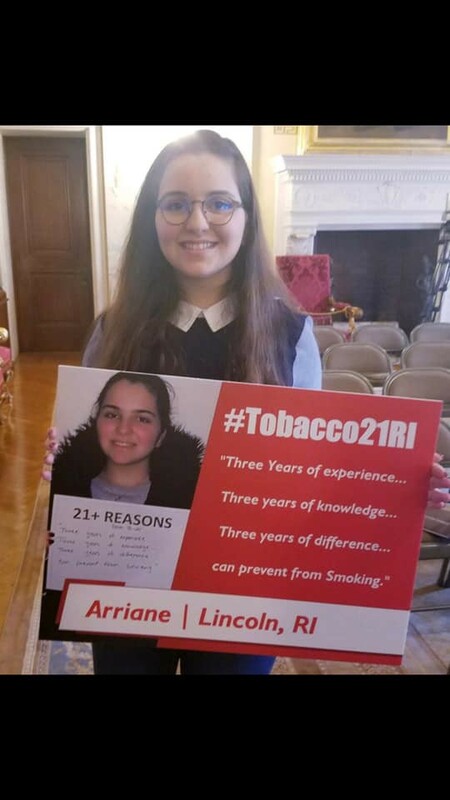 Her image was part of the 21Plus Reasons photo gallery at the RI Tobacco 21 Advisory Day. Arianne has participated in our past Town Hall Meeting, while being a part of the youth panel. Padi, Arianne’s mother, is an active member of the Lincoln Prevention Coalition. Congratulations Arianne!! For more pictures of this amazing day, click HERE! Lonsdale...Go ahead: Pick Your No's! Have YOU Picked YOUR "No's"?!?! 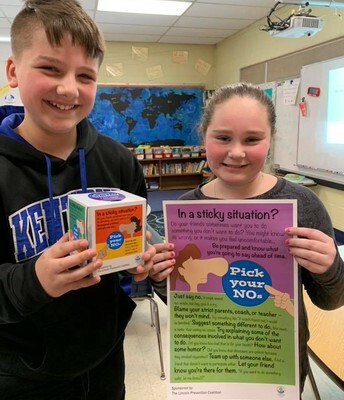 A very big thank you to Mrs. Goho, Nurse Newbury, Mr. Maloof, Ms. Lafoutain, Mrs. Moore and the AMAZING 5th graders of Lonsdale Elementary for welcoming the Lincoln Prevention Coalition to present “Pick Your NO’s”! 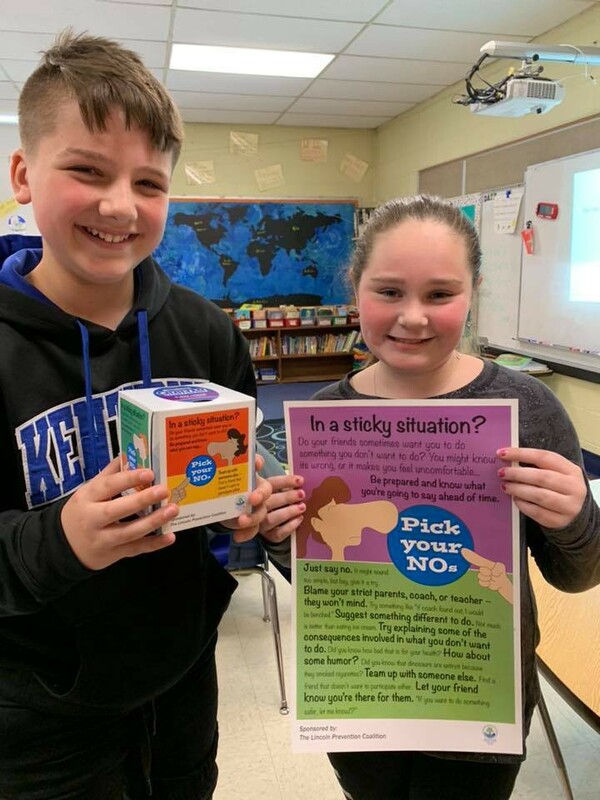 ”Pick Your NO’s” teaches our youth how to say NO to negative influences, ranging from bullying & substance abuse. They were an amazing bunch of respectful, kind and fun young adults! We are looking forward to the scheduled dates with other Lincoln Elementary Schools in the near future! And last, but not least, we are on Twitter at https://twitter.com/BVPrevention. 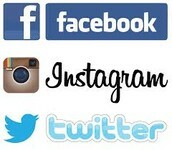 Be sure to "Like" and "Share" us with your friends and family! Have questions? Any suggestions? Please email Pam Shayer, at pshayer@lincolnri.org. 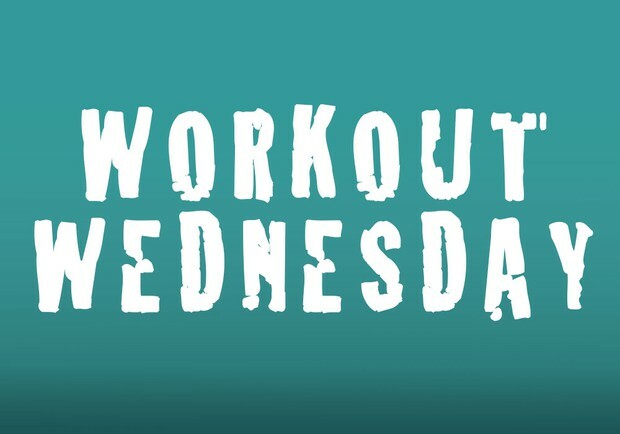 Work out Wednesday's in North Smithfield are a hit!!! Kudos to the Physical Ed. Department for creating this amazing experience & keeping our youth engaged and physically active. Be sure to check out this recent story by Channel 10 on the program! Click HERE! "Be The Person" in Cumberland! The Cumberland Prevention Coalition is proud to be a part of a unique mental health and substance abuse series at the Cumberland Public Library, encouraging members of the community to “Be That Person” who notices when someone is struggling and connects them to resources for help. 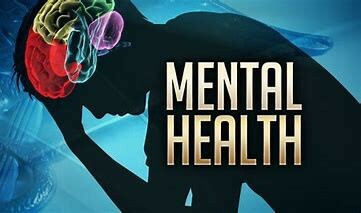 The goals of the series are to help reduce the stigma of mental illness and substance abuse, improve early identification of behavioral health issues, educate people about available resources, improve connection to treatment and ultimately reduce deaths to suicide and overdose. Monthly series topics run the fourth Wednesday of the month from January to May, excluding April. The workshops will address mental illness, substance abuse and trauma, as well as how to recognize when help is needed and how to access resources. There will also be special focus on developing strategies for talking to people about these uncomfortable topics. For more information, click HERE! 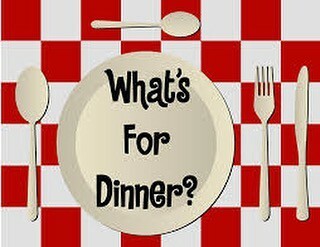 "What's for Dinner?" We've allll heard it! ..... but did you know.....it’s more important WHO is present AT the table, not WHAT is on the table?! 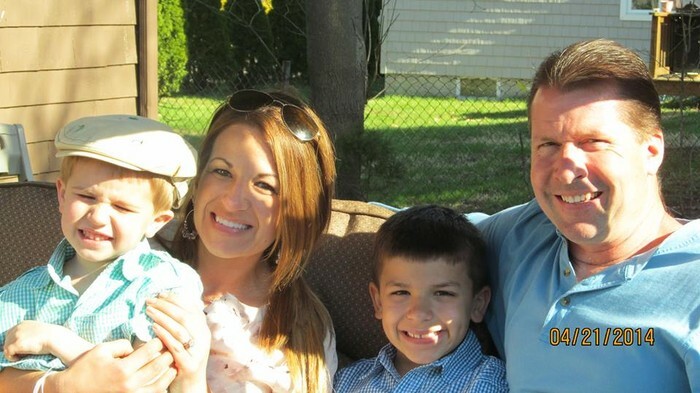 Between sport/work/dance schedules, so many families are eating "on the run". But research shows that dining together is more important than you might think! (1) Are less likely to engage in risky behaviors (drugs, alcohol, sexual activity). (2) Have better relationships with their parents. We urge parents to use this time wisely! Make it an "electronic-free" zone, & engage in conversation with your teen. “More frequent family dinners are related to fewer emotional and behavioral problems, greater emotional well-being, more trusting and helpful behaviors towards others and higher life satisfaction.” –Journal of Adolescent Health, April 2012. 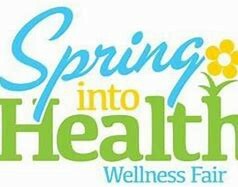 The Lincoln Prevention Coalition was proud to participate in the St. James Health Fair on March 2nd, 2019. There was FREE opportunities for all ages: healthcare screenings and prevention, health and wellness resources and education, as well as local family oriented organizations. National Drug Take-Back Day will take place on Saturday, April 27th, 2019! This is a PERFECT time for "Spring Cleaning"...and start with your medicine cabinet! The National Prescription Drug Take Back Day aims to provide a safe, convenient, and responsible means of disposing of prescription drugs, while also educating the general public about the potential for abuse of medications. The Towns of Cumberland and Lincoln are equipped with safe drop boxes, accessible 24/7 in the lobby of the towns' Police Departments. Interested in becoming a member of the Cumberland, Lincoln or North Smithfield Prevention Coalition? Interested in finding out or becoming a member of the Blackstone Valley Prevention Coalition? Please join us for our monthly meeting! Please join us & learn how YOU can be a part of prevention for the community! Please watch our Facebook page, Blackstone Valley Prevention Coalition, for more exciting news!